The Tregenda of the Old Goddess, Witches, and Spirits . 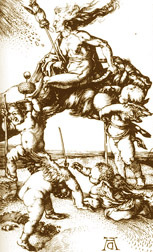 At the end of the middle ages an international myth of the Old Goddess stretched from the Slavic east to the Celtic west and from Italy to Scandanavia. People said that a vibrant, powerful crone flew in the midst of a cavalcade of spirits dead and unborn, joined by witches of all lands. On the eves of pagan holydays the spirit hosts set out for high mountaintops or other sacred places. At these animist sanctuaries the witches dance, play music and games, feast and celebrate their mysteries. The divine “Mistress of the Night” presides over the gathering, giving cures and revealing the future. Often she miraculously revives the animals the witches have been feasting on. The goddesses, their flight on the pagan festivals, even their destinations, all are closely interwoven in popular tradition with witches and faeries. A witch riding a tiger over the wind. 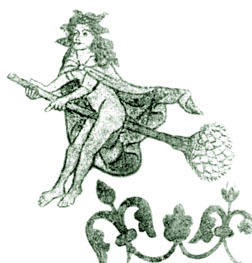 Over most of Europe, May Eve was a time when witches and the faery host were abroad. In Germany, Walpurgisnacht was marked by the mass flight of witches, who assembled on mountaintops to dance and make magic. Scandanavians also celebrated the trollathing (spirit assembly) with dance, song and witchcraft. [Lea, 406] So did the followers of Dzina in Rumania. The divine spinning crones Hölle and Bertha or Perchta travel “in the Twelves,” during the last days of the year. [Rey-Flaud, 187] The south German “wild women” also come into power during these Twölven. [Grimm, 929] Legend often presents the goddesses as old witches with shaggy hair. They appear suddenly, accompanied by infants, elves, dwarves, night-hags and enchantresses. [Grimm, 282] In Hesse and Thuringia, Holle led the Wild Hunt, riding a black horse with her wild hair streaming in the wind, as she blew a horn and cracked a whip. In Switzerland the Sträggele was abroad on the Embernight, checking to see if girls had finished their spinning, and punishing them if they had not. [Grimm, 934] Her title—which means “witchie”—adds a German diminutive to the Italian strega, recalling the 10th-century witch-goddess, striga Holda, of the Corrector Burchardi. and riding on a goat or ram. Villagers, especially young adults, impersonated Perchta's host in processions and ecstatic dances. [Pocs, 81] “Iron Berta” parades in a cow's hide with a bell at Holzberndorf in upper Franconia, giving nuts and apples to good children, but thrashing the ones who have been bad. [Grimm, 1370] The Perchten make the rounds at night, appearing in horned wooden masks with snouts or beaks, cloaked in black sheepskins, with hoods of badger or bear fur. They blow cowhorns, clash cymbals, shake poles festooned with bells. The Perchten run through the streets with glowing embers in their mouths, as if breathing fire. They rush into houses to “clean” them, and chase the shrieking children, threatening to put them in sacks. The mummers claim the offerings which have been set out for Perchta. [Rey-Flaud, 100, 182-7. Occasionally Nicholas appears in company with Perchta, Holle, or Frau Chunkle. In many places he displaced the Old Goddess as the primary figure. Like her, Nicholas carries a sack and is accompanied by masked, animal-skinned processions that surge into houses. His gifts and rewarding or punishing of children are themes originating with Befana or Perchta. The medieval witch goddesses travel during the twelve nights between Winter Solstice and the Roman New Year or, in churchly terms, between Christmas and Epiphany. This festival took its name from the ancient Greek mysteries: epiphania meant “divine appearance,” as when Kore appeared in the barley. The pagan name was assimilated into Christianity, where other pagan traditions promptly fastened themselves to it, persisting in spite of centuries of ecclesiastical attempts to re-form them.